An Infinite Descent into Pure Mathematics is licensed under a Creative Commons Attribution-NonCommercial-ShareAlike 4.0 International Licence. This means that you are welcome to use, download and share the textbook, provided that credit is clearly attributed to the author (Clive Newstead), that it is released under the same licence, and that it is not for commercial use. Version 0.2 was released Sunday 24th March 2019—see here for notes on what has changed since v0.1. Older versions can be found in the archive. Please be aware that this textbook is still a work in progress! 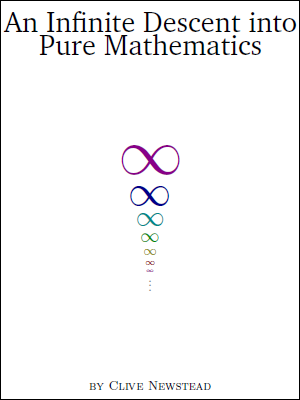 While enough of the book is written to cover a typical introductory pure mathematics course, I am currently working on additional sections that allow instructors more flexibility in what topics to cover. There are also portions of the book that I would like to edit substantially. Any feedback, be it from students, teaching assistants, instructors or any other readers, would be very much appreciated. Particularly useful are corrections of typographical errors, suggestions for alternative ways to describe concepts or prove theorems, and requests for new content (e.g. if you know of a nice example that illustrates a concept, or if there is a relevant concept you wish were included in the book). To send feedback, please find my contact information on my academic web page.